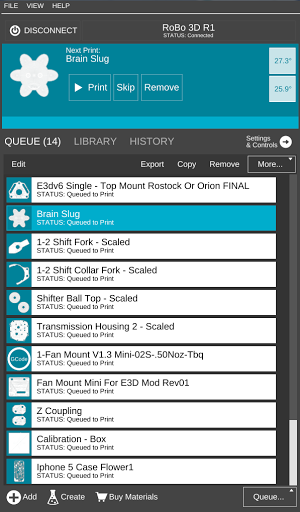 Manage 3D prints with MatterControl! MatterControl is an all-in-one desktop 3D printing software application created by MatterHackers, Inc. to organize and manage 3D prints. It features an intuitive approach to 3D printing, allowing users to queue multiple parts for printing without pre-slicing, preview and manipulate designs, as well as an integrated library which enables users to organize and search their design files. MatterControl is currently available for Windows/PC (Vista and above), Mac OS X (10.7+) and Linux (Ubuntu and Mint). Check out http://www.mattercontrol.com for more details. Select the download appropriate to your platform (Windows/Mac/Linux). Run the downloaded setup file. Review and accept the End-User License Agreement. After finishing the installation select 'Launch MatterControl'. When opening the application you will see a grey bar at the top of the window. Select 'Connect to a Printer'. If you have connected to this printer before, you should be able to select it from the list in the pop-up window (which will disappear after selection), and it will appear in the grey bar of the application's screen. To complete the connection process, select 'Connect' in the top left corner. Editing a printer: Step 1 (left) and 2 (right). 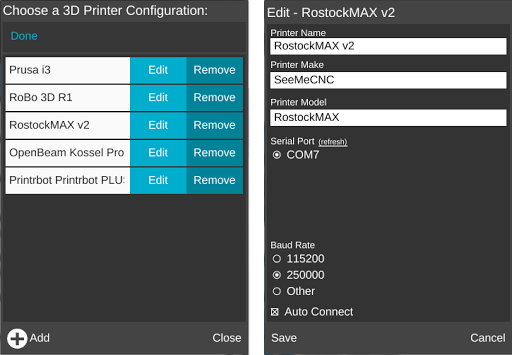 If you are unable to connect for any reason - ensure that your printer is turned on and connected, select 'Connect to a Printer', toggle edit mode, select the 'Edit' link next to your recently added printer, and double check the settings. This will bring you to a page where you can edit the name, make, and model of the selected printer- similar to the same page where you first set up the printer. Under the section that says 'Serial Port': turn on the printer, take out the usb plug, and hit 'refresh'- you will see the USB port where it was become grey. Then plug it in, hit 'refresh', then select the port that became highlighted. Hit 'Save', then it will take you back to the screen where you select a printer. Select the printer, which will take you back to the main screen, then click 'Connect' in the top left corner. Select the baud rate specific to your printer type. (TIP: 250000 is the most common and is set as the default. If you are unsure about your baud rate, trial and error can help you find the proper setting). If it is not your first time connecting a printer, this will bring you to a list of printers that you have previously set up with the computer. Connect your printer via USB cable and turn it on. Select the printer you wish to connect to. Printing a 3D object with MatterControl. 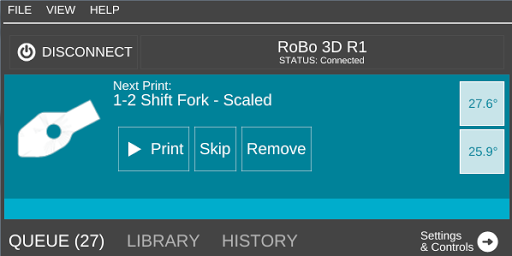 To print a 3D object using MatterControl, you'll first need an object to print. Press the 'Add' button, either at the bottom of the Queue or near the top of the application. A file dialog will open allowing you to select a .STL, .AMF or .GCODE file. Once you've selected a file, it will be added to your Queue and available for printing. To begin a print, check to make sure that the bed is clear, then press 'Print'. You can pause or cancel a print by selecting 'Pause' or 'Cancel' once the print has begun. After a print has finished, you can choose to reprint the object or select 'Done' to remove it from your print queue. Multiple items in the Queue. You can add objects to your print queue individually or you can select multiple files in the file dialog that appears once the ‘Add’ button is clicked. You can drag and drop single or multiple files into your queue at any time. You can remove individual files within your queue by clicking the 'Remove' button on a queue item, or by selecting a queue item in edit mode and then selecting the 'Remove' button at the bottom of your queue. Alternatively, to delete your entire queue at once, you can navigate to the ‘Queue’ menu in the bottom of the queue and select ‘Remove All’. 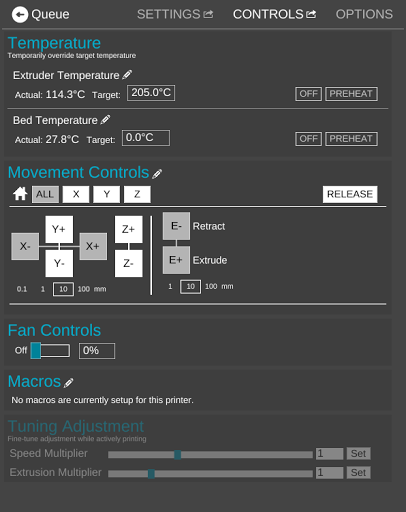 MatterControl lets you preview your part and shows in detail how it will be printed. You can preview a part at any time by clicking on the part's icon - an automatically generated silhouette of the part as it will appear from the top looking down. Clicking the part's icon will open the preview window. If available, a rotatable, zoom-able 3D representation of how your part will be printed will appear in the 3D View. Certain types of files (such as pre-generated .gcode files) cannot be previewed in this way. For more information, visit 3D View. Parts can also be previewed in Layer View - a layer-by-layer representation of how the 3D printer will construct your object. 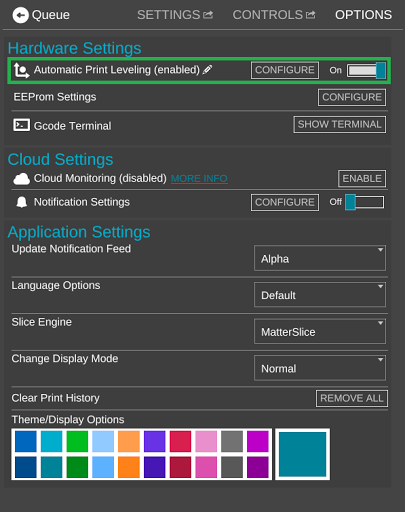 The Layer View is dependent on your current print settings and is only generated on demand - to create the layer view with your current settings click the 'Generate' button. Outside of printing you may want to manually control some of the functions of your printer. To access these controls, select the 'Settings' button and select 'Controls'. 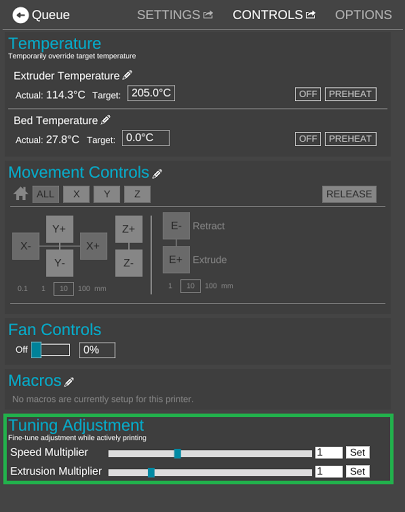 To set the temperature of your extruder or your temperature controlled heated bed (Note: Not all printers include bed temperature control), connect to your printer, select the appropriate entry box and type in the desired value. To disable heating - select the 'off' label. To move to one of the preset temperatures for common materials (PLA and ABS), select the label. To move your printer manually, select the desired axis (this may differ by printer, but generally z is up and down) and either add or reduce position. You can adjust the movement increment by selecting the amount at the bottom of the movement controls. To 'home' your printer on all axes, select the 'All' button to the right of the home icon. To 'home' a single axis, select the appropriate button to the right of the home icon. 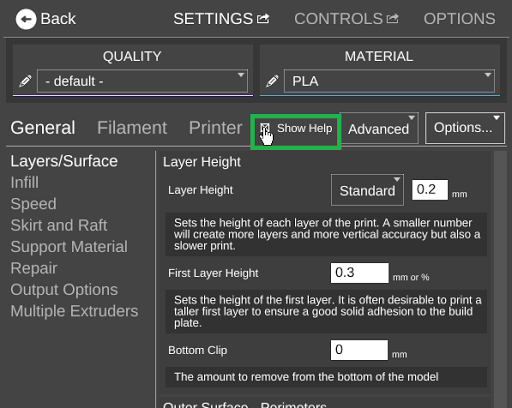 When selecting the 'Options' tab,under 'Hardware Settings' there is a section titled 'Automatic Print Leveling'. Here, we can actuate the Automatic Print Leveling feature. This walks you through a process where your printer becomes pre-calibrated at its most level so that, with every print thereafter, the printer will correct itself in such a way that every print will always be level. You can read more about this feature in-depth, as well as watch videos of it working, on the Bed Leveling page. While printing, the Tuning Adjustment meters allow you to adjust the speed of the extruder as well as the amount of filament being extruded. This can be helpful if you realize mid-print that the extruder is moving too fast for the filament to stick or if not enough filament is being extruded. These are the only settings you can adjust during a print; otherwise, you have to cancel the print, adjust the settings, and start over. Slicing is the process of turning your digital 3D model into instructions that your 3D printer can use to print an object. 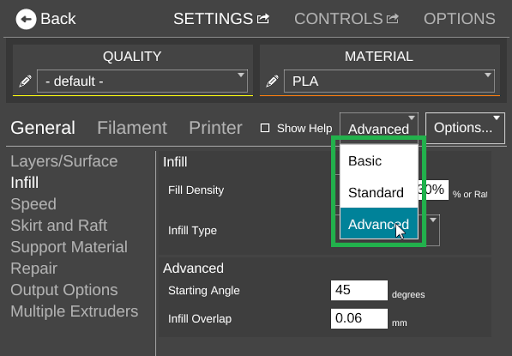 In MatterControl slicing is done on an 'as-needed' basis based on your current slicing settings. To modify your slice settings, click on the 'Advanced Controls' link and select 'Slice Settings'. Filament > Diameter: A printer-specific setting that will not change, usually 1.75mm or 3mm. 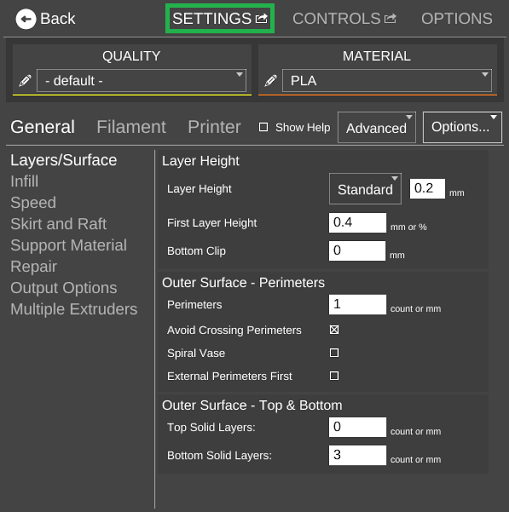 Filament > Temperature: Separated into first layer/other layers, this setting will dependent on your material. If you find that your filament has trouble sticking to the bed, try setting the temperature a few degrees hotter for the first layer than the rest of the layers. Print > Layer Height: Think of this as the speed versus quality setting, a lower layer height will have fewer visible layers, but take longer to print. 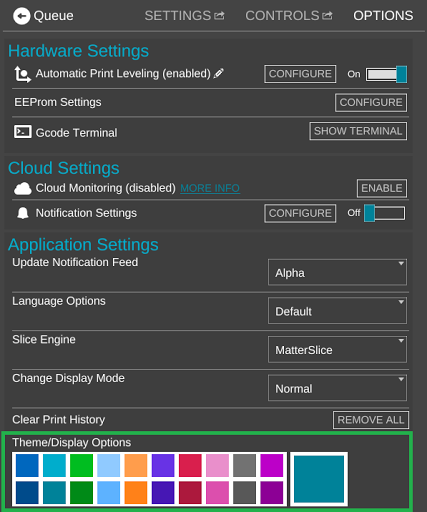 If you modify your slice settings while connected to a specific printer you have the option to 'Save' or 'Revert'. Unsaved changes will still be used in your current prints, but not they will not be saved when the application is closed. When you 'Revert' the slice settings you restore them to the latest saved state. From the 'Settings' screen, a drop down box allows for selection of the printer user level. These levels are Basic, Standard and Advanced. Basic mode allows for minor adjustments to the print, like layer height, fill density, and chose to use support material and rafts. It is useful for beginners. Intermediate mode offers a few more options for the customization of layers and perimeters, infill, skirts and brims, and support material. At this level Filament and Printer specifications can also be adjusted. Advanced mode gives control over every aspect of the print, including all the above features, plus Repairs, Output Options, Multiple Extruders, and other advanced content. You can change the accent color to match your preference by selecting 'Options' under the 'Settings' tab in the top right corner of the main screen. This page was last modified on 8 March 2016, at 14:48.